Go solar through a co-op saves you, on average, $35,000 on energy bills over the next 25 years. Saves you an average of $35,000 on energy bills over the next 25 years. Increases the value of your home by roughly $21,000. Greenhouse gas reductions vary by state and region, but a typical 7 kW system will eliminate 118.6 tons of carbon dioxide equivalent (CO2e) emissions over its 25-year lifespan. A typical solar co-op will eliminate 3,558 tons of carbon dioxide equivalent (CO2e) emissions over the next 25 years. Solar can significantly reduce (and sometimes eliminate) electricity bills, which puts money back in your pockets. 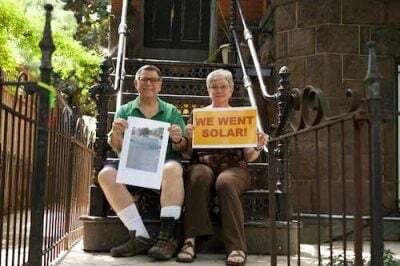 Instead of exporting these dollars to out-of-state utility holding companies, solar allows people to improve their own financial well-being and keep their wealth reinvested in the local community. Solar supporters join together for a Solar Congress in Ohio. Of course, there are some big differences in project size, cost, job creation impacts, etc. between rural and urban areas, and between Florida and Minnesota! These numbers are averages and are for illustrative not evaluative purposes.